Power of Attorney in Cincinnati OH: What Is the Difference Between a General and a Limited POA? A power of attorney in Cincinnati OH names an agent or attorney-in-fact who will have the ability to act in your behalf in a legally binding manner. There are different types of powers of attorney. Let’s look at the distinctions between a general power of attorney and a limited power of attorney. One type of power of attorney is the general power of attorney. If you execute a general power of attorney, you are giving the attorney-in-fact broad decision-making capabilities. This individual could act in your behalf under a broad range of circumstances. In fact, with a general power of attorney the agent that you choose can basically do anything that you can do. His or her signature signed in your behalf is as good as your own. Clearly, you are going to be taking a huge leap of faith if you give someone this much power to act for you. However, under certain circumstances, a general power of attorney can provide a much needed solution. There may be situations where you may want someone to be able to act for you on a limited basis without giving this individual the broad range of authority that a general POA would grant. This can be accomplished through the execution of a limited power of attorney. A Limited POA is for specific, defined purposes, and generally lasts only as long as it takes to accomplish those purposes. To provide an example demonstrating how a limited power of attorney may be useful, assume you had back surgery, and you are physically disabled for an extended period of time. There is nothing wrong with your ability to make decisions, but you still have severe physical limitations. You are a very active and engaged business person. There are always important, legally binding documents that must be signed. They can’t always be brought to you, because some situations have to be handled at various different locations. It would be possible to give someone a limited power of attorney to act in your behalf for defined business purposes while you are recovering from surgery. The power of attorney can expire once you are able to get around on your own. You can also create a limited power of attorney that only gives certain, specific powers to your attorney-in-fact. Suppose you are purchasing a piece of property in Alaska, but you live in Cincinnati. You are buying the property because your brother, who lives in Alaska, recommended the purchase. If you don’t want to fly to Alaska, or if you simply don’t have the time, you could give your brother a limited power of attorney to consummate this single transaction in your behalf. This type POA is often used by married couples when one spouse is out of town at the time of closing a purchase or sale of real estate. 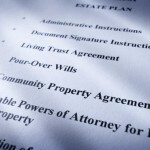 A Power of Attorney is a critical document in estate planning. Usually a POA for this purpose is a General Property Power of Attorney. There are other decisions to be made when designing a POA, such as whether it is to be immediately effective or effective upon occurrence of a specified event (a “Springing POA”). Also whether there are any controls or oversight to apply to an Agent’s actions. We’ll talk more about these issues in the future.